There are very few places on this planet that both amaze me and scare me. William Ricketts Sanctuary is one of those places. Throughout the lush Dandenong forest, you'll find intricate carvings of Aboriginal Australians blending seamlessly into the surroundings. Any Doctor Who fans out there? If so, William Ricketts Sanctuary may be right up your alley! The Sanctuary gives off a little bit of a Doctor Who Weeping Angel vibe. The entire time walking through the sanctuary I kept wanting to make sure I was looking at each of the statues as to not get sent back in time. Anyone else get a Weeping Angel vibe? As soon as you enter the sanctuary, you are embraced by this amazing sculpture garden. The gardens project a place of spiritual tranquillity. The sculptures, half hid by the ferns and other natural fauna, aid in making the sanctuary the perfect place for quiet reflection. As you continue to walk through the sanctuary, you truly get to see William Ricketts vision unfold. The house where William used to live serves as an additional information centre. In the house, you're able to learn more about the life and vision of William. It was a beautiful place to a take a little bit of a rest and learn more about the inspiration behind the sculptures. Incredible he never had any training! It takes about 15-20 minutes to walk through the entire sanctuary however, one could quite easily spend up to an hour looking at all the beautiful, mysterious statues. If you're travelling through the Dandenong Ranges, it is a beautiful, quick stop before exploring other areas. If you choose to stop by after going on a hike (like we did), I would suggest ending the day at the Alfred Memorial Gardens. It is located within close proximity of the Sanctuary and is a lovely way to end the day. 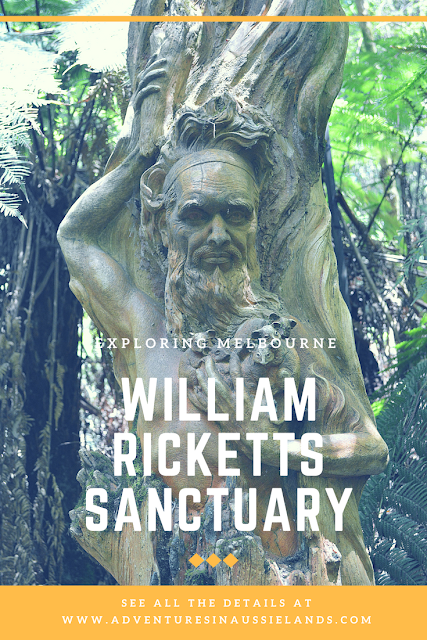 If you were in Melbourne would you want to visit William Ricketts Sanctuary? If you have visited, what was your favourite part about the sanctuary? Want to learn more about the Dandenong Ranges? Click HERE! Wow. This is s very interesting place to visit. So very interesting. And YES I'd definitely go see it if I ever get to Melbourne.